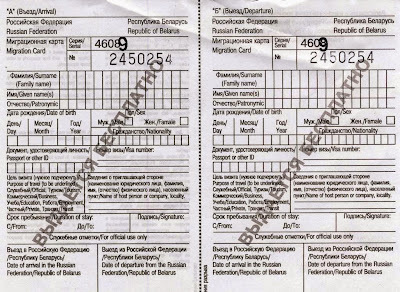 Before you go through Russian passport control, you have to fill a special form called "migration card" (migracionnaya karta). You can fill it on English or Russian languages. Cards are given by hostess in train or airplane, also you can get it in the airport. Nowadays in major airports you don't have to fill migration card by yourself - border guard officer would fill it on PC after you'll give him your passport. Every foreign citizen must fill this card, even if he has residence permit. After filling card will be stamped and divided into two parts. One half will be returned to you, second goes to border guard officer. You must save it during whole trip, and submit at passport control when you leave the country. As you can see, there are two identical halves - one for you, second for Migration Service. Form is not hard for understanding. The "Address (host organization) in Russia" is the address of the organization that issues your visa support documents. It is written in your visa sticker. Just rewrite it into your card.